The anterior cervical discectomy and fusion with instrumentation (ACDFI) technique involves the additional stabilization of the cervical spine with instrumentation. Early instrumentation involved wiring techniques. This was largely modified to cervical plate technology after their introduction and application in the 1980s. Design has subsequently improved to now include constrained, nonconstrained, rotational, rigid, and dynamic plate subtypes  . Argued benefits of plate instrumentation include reduced graft dislodgements, increased fusion rates, and decreased foraminal stenosis. However, as with the introduction of bone graft, the additional placement of hardware introduces hardware-related complications. Since their introductions, heated debates have compared ACD, ACDF, and ACDFI. Prospective randomized controlled trials have been performed that demonstrate similar clinical outcomes between the 3 groups, with a decreased rate of cervical fusion and increased incidence of kyphosis in the ACD group. [3, 13, 14, 15] Guidelines were also published in 2009. Proponents and detractors for these different procedures can be found throughout the scientific and surgical community. The purpose of this article is not to compare and contrast these different surgical techniques or plate technologies but to highlight the role of these 3 procedures for treatment of cervical spine disease. As mentioned above, ACD, ACDF, and ACDFI are different but very similar techniques for the surgical treatment of cervical spine disease. This article discusses the differences between these techniques. When referring to the ACDFI technique, various plate technologies exist. These can be roughly categorized as rigid versus dynamic versus rotational, nonconstrained versus constrained, and rotational plating systems. Recent biodegradable and single-screw-per-vertebral body systems have also been introduced. The nuances of these plating systems are not discussed in this article. When referring to the bone graft techniques, namely ACDF and ACDFI, surgical choices of using autograft and allograft exist. The differences between these types of bone graft are not discussed. The indications for ACD, ACDF, and ACDFI include cervical spine trauma and resulting instability, radiculopathy, myelopathy, osteomyelitis, spondylosis, vertebral body tumors, opacified posterior longitudinal ligament, and postlaminectomy kyphosis. 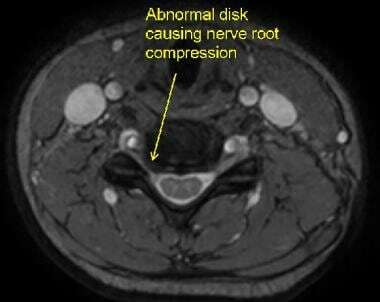 (Left) MRI, Sagittal T2 sequence, demonstrating a central cervical disk herniation causing cervical myelopathy. (Center) MRI, Axial T2 sequence, demonstrating a normal cervical disk that does not cause compression of the spinal cord or the exiting nerve roots. (Right) MRI, T2 Sequence, Axial T2 sequence, demonstrating a central disk herniation causing compression and deformation of the spinal cord, causing symptoms of cervical myelopathy. MRI, Axial T2 sequence, demonstrating a right-sided cervical disk herniation causing cervical nerve root impingement and resulting radiculopathy. Patient selection is important in complication prevention. Increased patient age, decreased bone density, and a positive smoking history can play a role in increasing complication rates. Additionally, an increase in the number of planned cervical levels to be decompressed can increase the complication risk. Antibiotic infusions prior to skin incision should be used to decrease wound infection rates. Intraoperative fluoroscopic radiography should also be used to assess the cervical spine and facilitate proper hardware placement. An operative microscope that magnifies the operative field but also provides a strong light source is helpful. Intraoperative spinal cord monitoring has also been used as an effective measure for avoiding spinal cord and nerve root injury during surgical procedures. Complications related to neck surgery are also possible. Dysphagia due to esophageal retraction and intubation has been reported to range from 4%-16%. [19, 20, 23] Postoperative neck hematoma causing airway obstruction has been reported. [19, 20] Esophageal perforations can also occur, especially during the opening approach to the vertebral body. Hirsch C, Wickbom I, Lidstroem A, Rosengren K. Cervical-disc Resection. A Follow-up of Myelographic and Surgical Procedure. J Bone Joint Surg Am. 1964 Dec. 46:1811-21. [Medline]. Murphy MG, Gado M. Anterior cervical discectomy without interbody bone graft. J Neurosurg. 1972 Jul. 37(1):71-4. [Medline]. Bertalanffy H, Eggert HR. Complications of anterior cervical discectomy without fusion in 450 consecutive patients. Acta Neurochir (Wien). 1989. 99(1-2):41-50. [Medline]. Hankinson HL, Wilson CB. Use of the operating microscope in anterior cervical discectomy without fusion. J Neurosurg. 1975 Oct. 43(4):452-6. [Medline]. SMITH GW, ROBINSON RA. The treatment of certain cervical-spine disorders by anterior removal of the intervertebral disc and interbody fusion. J Bone Joint Surg Am. 1958 Jun. 40-A(3):607-24. [Medline]. Dowd GC, Wirth FP. Anterior cervical discectomy: is fusion necessary?. J Neurosurg. 1999 Jan. 90(1 Suppl):8-12. [Medline]. Palma L, Mariottini A, Carangelo B, Muzii VF, Zalaffi A. Favourable long-term clinical outcome after anterior cervical discectomy. A study on a series of 125 patients undergoing surgery a mean of 11 years earlier. Acta Neurochir (Wien). 2010 Jul. 152(7):1145-52. [Medline]. Xie JC, Hurlbert RJ. Discectomy versus discectomy with fusion versus discectomy with fusion and instrumentation: a prospective randomized study. Neurosurgery. 2007 Jul. 61(1):107-16; discussion 116-7. [Medline]. Omeis I, DeMattia JA, Hillard VH, Murali R, Das K. History of instrumentation for stabilization of the subaxial cervical spine. Neurosurg Focus. 2004 Jan 15. 16(1):E10. [Medline]. Shao H, Chen J, Ru B, Yan F, Zhang J, Xu S, et al. Zero-profile implant versus conventional cage-plate implant in anterior cervical discectomy and fusion for the treatment of degenerative cervical spondylosis: a meta-analysis. J Orthop Surg Res. 2015 Sep 17. 10 (1):148. [Medline]. Rosenørn J, Hansen EB, Rosenørn MA. Anterior cervical discectomy with and without fusion. A prospective study. J Neurosurg. 1983 Aug. 59(2):252-5. [Medline]. Savolainen S, Rinne J, Hernesniemi J. A prospective randomized study of anterior single-level cervical disc operations with long-term follow-up: surgical fusion is unnecessary. Neurosurgery. 1998 Jul. 43(1):51-5. [Medline]. Matz PG, Ryken TC, Groff MW, Vresilovic EJ, Anderson PA, Heary RF, et al. Techniques for anterior cervical decompression for radiculopathy. J Neurosurg Spine. 2009 Aug. 11(2):183-97. [Medline]. Selvanathan SK, Beagrie C, Thomson S, Corns R, Deniz K, Derham C, et al. Anterior cervical discectomy and fusion versus posterior cervical foraminotomy in the treatment of brachialgia: the Leeds spinal unit experience (2008-2013). Acta Neurochir (Wien). 2015 Sep. 157 (9):1595-600. [Medline]. Shriver MF, Lewis DJ, Kshettry VR, Rosenbaum BP, Benzel EC, Mroz TE. Pseudoarthrosis rates in anterior cervical discectomy and fusion: a meta-analysis. Spine J. 2015 Sep 1. 15 (9):2016-27. [Medline]. Bose B. Anterior cervical fusion using Caspar plating: analysis of results and review of the literature. Surg Neurol. 1998 Jan. 49(1):25-31. [Medline]. Zaveri GR, Ford M. Cervical spondylosis: the role of anterior instrumentation after decompression and fusion. J Spinal Disord. 2001 Feb. 14(1):10-6. [Medline]. Caspar W, Geisler FH, Pitzen T, Johnson TA. Anterior cervical plate stabilization in one- and two-level degenerative disease: overtreatment or benefit?. J Spinal Disord. 1998 Feb. 11(1):1-11. [Medline]. Epstein NE. Reoperation rates for acute graft extrusion and pseudarthrosis after one-level anterior corpectomy and fusion with and without plate instrumentation: etiology and corrective management. Surg Neurol. 2001 Aug. 56(2):73-80; discussion 80-1. [Medline]. Mayr MT, Subach BR, Comey CH, Rodts GE, Haid RW Jr. Cervical spinal stenosis: outcome after anterior corpectomy, allograft reconstruction, and instrumentation. J Neurosurg. 2002 Jan. 96(1 Suppl):10-6. [Medline]. Paramore CG, Dickman CA, Sonntag VK. Radiographic and clinical follow-up review of Caspar plates in 49 patients. J Neurosurg. 1996 Jun. 84(6):957-61. [Medline]. Shapiro SA, Snyder W. Spinal instrumentation with a low complication rate. Surg Neurol. 1997 Dec. 48(6):566-74. [Medline]. Deletis V. Intraoperative neurophysiology of the corticospinal tract of the spinal cord. Suppl Clin Neurophysiol. 2006. 59:107-12. [Medline]. Upright lateral plain film following an anterior cervical diskectomy and fusion, demonstrating the bone graft between the vertebral bodies and the abutting cervical plate.